Dog Federation of New York: Dog Federation of NY on Proposed Change to APHIS Regulations: OPPOSED! Dog Federation of NY on Proposed Change to APHIS Regulations: OPPOSED! 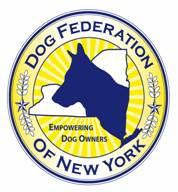 The Dog Federation of New York is a not-for-profit coalition of individual dog owners and dog-related organizations committed to responsible ownership with a membership that spans the State of New York. Our members are animal shelter volunteers, dog trainers, pet owners, purebred dog breeders and exhibitors, animal control officers, and animal lovers. We are committed to helping public officials respond appropriately to the concerns we all share, including providing for the public’s health and safety while addressing concerns on animal welfare issues. The rate of pet ownership is at an all-time high in the United States and a strong majority of citizens are pet lovers, based on the estimated 62% of households which include at least one pet animal. The most common pet, of course, is the family dog. The growth of the pet industry continues to significantly outperform many sectors of the national economy. Despite the recession, Americans spend record-breaking amounts of money on their pets. In short, we are a nation of dog owners and pet lovers, and our desire to obtain and live with pet animals shows no sign of abating. Prospective purchasers currently enjoy a range of responsible sources for pets, including small “hobby” or non-commercial breeders, shelters and rescues, and pet retailers. The Dog Federation of New York believes that it is vital to the public interest to support and encourage lawfully conducted and humane breeders and retailers and to resist efforts to unreasonably curtail the supply of healthy pet animals to families in our country. We write to express our opposition to the above-captioned proposal and our concerns regarding the damage implementation could do to the lives of caring animal owners and the pets they love by pointlessly and counter-productively suppressing the responsible breeding and sale of pet animals through over-reaching and poorly-considered regulation. Such regulation will only further restrict public access to healthy pets.